In Riverside and San Bernardino alone – AKA “The Inland Empire” – more than 800,000 people live below the poverty line, and 400,000 are food insecure. It’s a major problem that requires a major community commitment – and that’s exactly what this month’s ePromos for Good recipient provides. 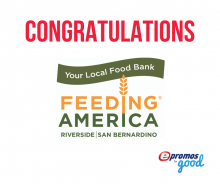 Since 1980, Feeding America Riverside | San Bernardino (FARSB) – formerly Survive Food Bank – has been distributing food across the Inland Empire. In partnership with 400-plus local nonprofits, FARSB now distributes more than two million pounds of food each month to 100,000 people. Despite these epic numbers, FARSB is showing no signs of slowing down – at least not until the entire community has access “to an adequate and nutritious food supply.” To continue this mission, the organization draws on local community support, including campaigns anchored by area businesses such as Juice it Up!, Winco, Walmart, Amazon, Allstate and more. Through events, in-store donations and in-kind gifts, FARSB continues to grow, evolve and get the word out – and support even more area residents in the process. As this month’s ePromos for Good winner, FARSB will receive a $500 credit to be used on promotional premiums to help get the word out even more. Congratulations! At ePromos, we believe promotional products are more than just branded gifts – used right, they can help change the world. That’s where ePromos for Good comes in. Every other month, ePromos chooses a charity or nonprofit and awards a $500 credit. With it, the winning organization can choose any branded premiums from the ePromos site and use those items for anything – as fundraising gifts, volunteer awards, events or, simply, just getting the word out about their incredible work. Recent ePromos for Good recipients have been incredibly diverse, though all have one thing in common: they’re committed to doing good in their communities and beyond. Past recipients include the Rescue + Freedom Project, Save a Child’s Heart and the National Youth Internet Safety and Cyberbullying Task Force.